Do you want to learn a new thing about me today? Well, I am going to share anyway….Fact about Nikki: I don’t really care for winter. I know…gasp :). When I was single or married without young kids I found things to enjoy the bitter cold, or at least ways to distract me from it. Now, being a stay at home mom to a two-year-old and 5-month-old, I am very limited on what I can do in the winter. We live in Utah, so winters can get pretty cold and snowy. My daughter and I get a little stir crazy being home all day. I mean, there is always hanging out with other moms and their kids, but we miss the outdoors, and having a small baby makes it even harder to get outside. So, come winter, I like to bake things that remind me of summer. It helps my winter blues. Let me introduce you to a winter version of S’mores. 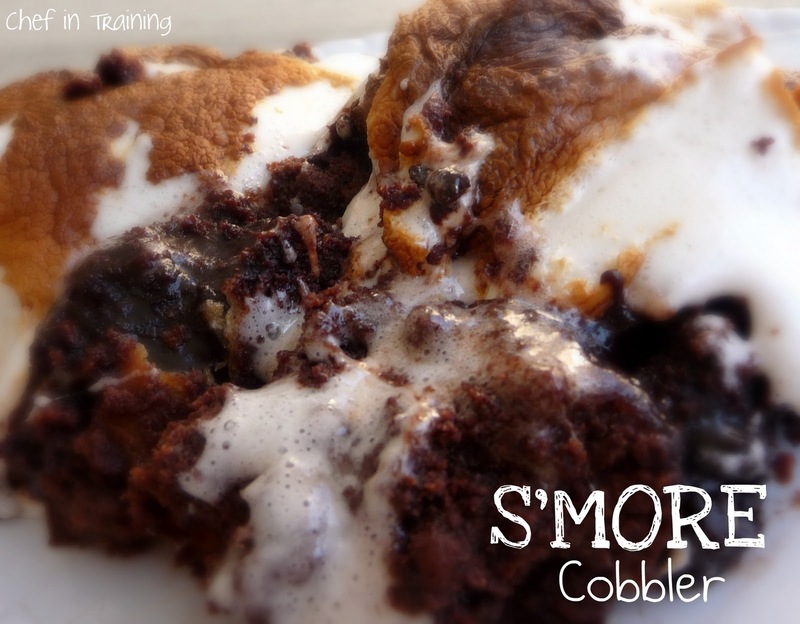 S’more Cobbler. It has everything you love in a S’more that can be baked in the comfort of your warm home. I read some of the comments on the original post and noticed some people had problems with the dry cake/butter layer, so I adapted it a little and I did not have any problems with it, other than I may have eaten too much! :) But Note, the cake layer won’t have a cake-like texture. It is a cobbler so it will be drier compared to a cake. Combine milk and chocolate pudding package. Pour into a greased 9×13 pan and spread evenly. Break graham crackers in half so that you have 12 squares. Place the graham cracker squares on top of the pudding leaving space between each square. Sprinkle on the mini chocolate chips. I added a little more because I love as much chocolatey-goodness as I can get! Melt butter in microwave. Mix in cake mix to the melted butter until completely blended. Spread on top of the mini chocolate chips/graham crackers. Remove and place large marshmallows on top to cover. Bake another 5 minutes then switch oven to broil. Watch closely at this point because your marshmallows will brown fast. It should only take 1-2 minutes to brown after the oven has been switched to broil. Take out of oven and let cool a little bit. This is best eaten warm! This looks absolutely incredible. My mouth is watering just from looking at it! Im having a Christmas party later today, I may whip these babies up for it:) I know they'll be a huge hit. Thanks for posting! I'm always impressed with your recipes, but this is off the charts! Even for you!! By the way, did you link this up at my party? I would LOVE to feature it next week! I feel the same way about winter. This is a great way to bring a reminder of summer into my life when Jack Frost is nipping at my nose. I will be making this for friends tonight and I think I will serve it with some hot chocolate! Thanks, great post! looks like a little bit of summer in a bowl. What's not to love!? You're seriously torturing me with this one. I'm all over that. I'm agreeing with Lisa! You are torturing us with these yummy treats! I love smore's! The problem is when I have smore's all I want is MORE!! he he Gooky, I know! Holy cow, that's absolutely amazing and I must try it! My jaw is on the floor. This sounds beyond amazing! I'm so excited to give this a shot! I tried this recipe last night because I'm participating in a dessert competition at work tomorrow and I wanted to test it out! IT was WONDERFUL. Just a couple of suggestions: I was unclear from the instructions that you actually had to cook the chocolate pudding and then mix the pudding mixture with an additional cup of whole milk. I looked at other recipes to double check this part.Also, the graham crackers are an essential ingredient so I plan on leaving very little space between them when placing them on top of the pudding. And, I'm going to crumble a few more graham crackers and place them on top of the cake mixture. An incredible recipe and I'll let you know if I win! okay, seriously? You're supposed to cook the pudding before adding the extra milk and putting it in the pan? Would have been nice if this was in the recipe above. Really hoping this still comes out okay otherwise I'm screwed. @LisaT I didn't cook my pudding and it still turned out. It cooks while in the oven. Let me know if yours does as well. Also, the reason for leaving a little space between the graham crackers, is so the pudding can boil up and help moisten everything. Let me know how it turns out for you! Sooooo, I'm slightly confused, we cook the pudding then add an additional cup of milk? Also, do we put all ingrediants with the cake mix? Or are we just mixing the dry cake mix with the butter to make it more crumbly like a cobbler crust? I'm sorry I'm confused, but this sounds delicious and I want to make it correctly. Thanks! yeah I was unsure about the cake part too! were you supposed to make the cake according to the box directions and then add the butter or just the mix and butter alone! I just made it with the butter only and crumbled it on top! well see how it turns out! How can I print your recipes? How should I store this? In the refrigerator? Can I use instant pudding instead of cook and serve? I already have some of it at home. Hello there! I wanted to ask what may seem like a silly question. Do you need to prepare the cake mix as you would if you were just going to bake it by itself?